In 2016, Morningstar released the Morningstar Sustainability Rating to help investors use environmental, social, and governance, or ESG, information to evaluate investments. Using company-level ESG ratings from Sustainalytics, the Morningstar Sustainability Rating provides a reliable, objective way to evaluate how well funds are meeting ESG challenges, based on the ESG profiles of their underlying holdings. In October, we enhanced the current methodology; it was always our plan to enhance the rating as trends evolved in the sustainability investing landscape. The ratings changes reflect our improved ability to make assessments over a longer time horizon and across more broadly based categories. Increasing the coverage threshold for a portfolio to receive a sustainability score to 67% of assets. Expanding peer groups by using the Morningstar global category system. Increasing the peer group threshold to 30 scored portfolios for funds in the peer group to receive Sustainability Ratings. To explore differences in the methodologies, we'll walk through some examples that highlight some of the key changes, including the historical fund sustainability score and the global category peer group. 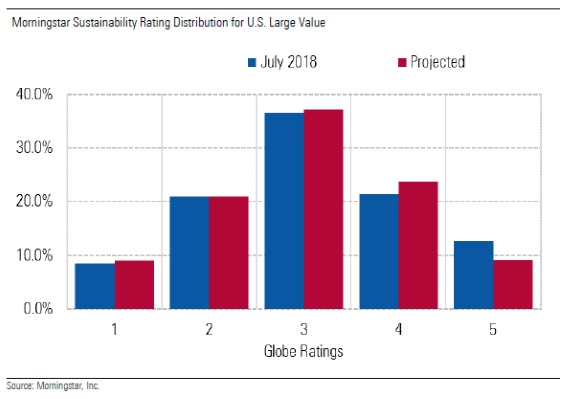 The Morningstar Sustainability Ratings will now be based on the historical portfolio sustainability score, a measure incorporating the trailing 12 months of portfolios, instead of using the sustainability score from just the most recent portfolio. While the most recent portfolio sustainability scores are valuable for helping investors analyze current holdings, they may not reflect the manager's longer term decision-making process. Looking back in time gives us insight into whether ESG considerations are applied consistently. To combine both viewpoints into a single data point, we constructed a 12-month weighted average, where the most recent portfolio holdings are overweight relative to older holdings. There are two aspects to note. First, we are incorporating 12 months of portfolio to derive the historical score. As Morningstar continues to build a time series of security-level ESG scores, we may consider evaluating a manager's sustainability over a longer period. Second, the portfolio coverage threshold increased to 67% from 50%. The increased threshold provides additional rigor around our calculations and consistency across other sustainability portfolio metrics. The resultant scores reflect our improved understanding of what funds own. 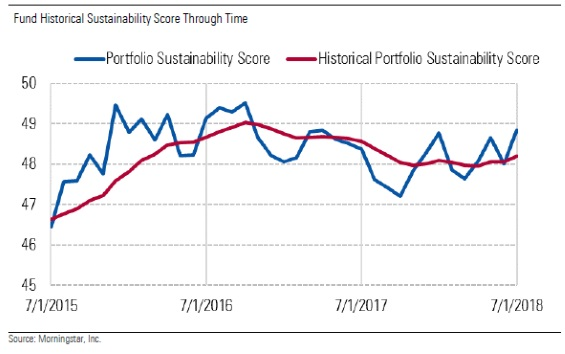 This exhibit shows the smoothing effect of the 12-month historical sustainability score relative to the point-in-time portfolio sustainability scores. In one year, the point-in-time score deviates more than three points. Given that this portfolio's category's average monthly standard deviation is two points, the three-point jump is extremely meaningful. Second, the historical score trails the current score. The historical fund sustainability score acts as a more conservative numerical value than the spot score. The historical number does not move around with the noise of monthly portfolio holdings. As intended, the historical score should provide a more useful way to evaluate a fund's sustainability merits over the longer term, while still reflecting more recent changes. The peer groups used to assign the Morningstar Sustainability Rating will now be based on the Morningstar global category system rather than the Morningstar Category system. Under the original methodology, the Morningstar Category system was used to define peer groups for the assignment of the Morningstar Sustainability Rating. Given the Morningstar global categories are typically larger than Morningstar Categories, we increased the peer group threshold to 30 scored portfolios for funds in the peer group to receive sustainability ratings. Since the initial launch, we have found the Morningstar Category system to be too granular in nature for a portfolio-based rating. The Morningstar Category system first requires investments to be grouped based on their availability for sale in a given market, and, in some cases, the fund's base currency. This resulted, in some cases, in very small peer groups in which rating break points fluctuated based on small changes to portfolio sustainability scores. The Morningstar global category is a system of peer groups for managed portfolios based on investment strategy without regard to where they are available for sale. For example, under the Morningstar global category system, all diversified emerging-markets funds are in the same peer group, regardless of where a fund is available for sale. Moving to the global category system affects funds in small Morningstar Categories and in categories with homogenous scores more than funds in large, diverse Morningstar Categories. For example, we don't expect any major changes in a category like U.S. large value. Since the launch of the sustainability rating in 2016, we have been looking at ways to enhance the rating as trends evolve in the sustainable investing landscape. Including a 12-month view of a fund's holdings incorporates more information for investors who want to evaluate a fund's sustainability performance and makes it easier for investors to assess a fund's consistency in this area. Additionally, moving to Morningstar global categories results in larger, more robust peer groups.